One of the main reasons to use SUMPRODUCT is to calculate conditional totals based on data, according to a set of criteria. Were certificate U and released in or after 2002. We'll enter a formula in D2 and copy it down. Note that you could use the SUMIFS function to solve this problem, but it would be messy and difficult to create and understand. The total number of Oscars for certificate 15 films not made by Universal Pictures from 2000 onwards is 7. Whether it was not made by Universal Pictures. 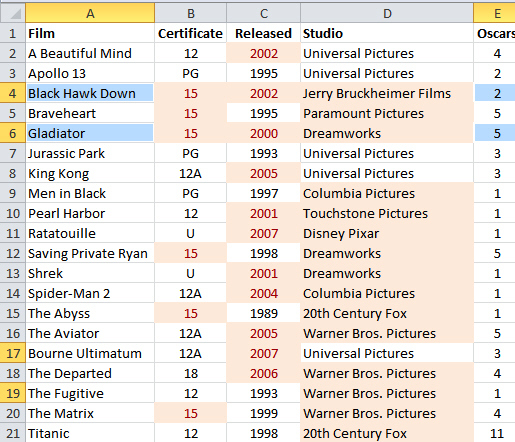 Colouring the cells satisfying the criteria for each column clearly shows that only Black Hawk Down and Gladiator satisfy all 3 of the criteria. The sum of their Oscars is 2 + 5 = 7. This is what SUMPRODUCT does - but it does it separately for every row of conditions. It's exhausting just thinking about it! You can have up to 30 arrays - enough for most people! Here we're showing a 0 whenever a condition is not true, or a 1 whenever it is false. You'd insert this formula in the selected cell then copy it down. the studio isn't the one entered in cell C2. However, this doesn't work! The reason is that instead of returning 1s and 0s, the arrays return TRUEs and FALSEs, and these aren't always treated as 1 and 0 in formulae. There are two possible solutions. Notice the two minus signs in front of each logical condition, to ensure that the results are treated as 1s and 0s. Which of these two solutions you prefer is up to you! The functions are explained in more detail below. Start Whether each cell in the Studio range begins with the text entered in cell B2 (ie 20th). End Whether each studio ends with the text entered in cell B3 (ie Fox). Middle Whether each studio contains the text entered in cell B4 (ie the word Century). The function works by searching within the studio name for the text entered, and testing whether this returns an error because the text isn't found. Note that as far as this owl can tell there is no way to use wildcards such as * (to represent a series of characters) or ? to represent a single character, although these can be used for functions like SUMIF. Having looked at one use of the SUMPRODUCT function, I'll now take a brief look at another - using it to give weighted averages.